Now that we have been in our house for about 2 months, it was time to get to know the neighbors. We have met them briefly in passing but I thought it would be nice to actually go over and introduce ourselves. I have heard several stories of people who do not get along with their neighbors and all of the horrors that follow. Luckily, ours seemed pretty friendly. I wanted to make a sweet treat to bring over as we met our neighbors. A friend of mine mentioned how she likes chocolate pudding as an easy and somewhat “light” way to get your chocolate fix. This was sort of stuck in my head when I was thinking of dessert ideas. 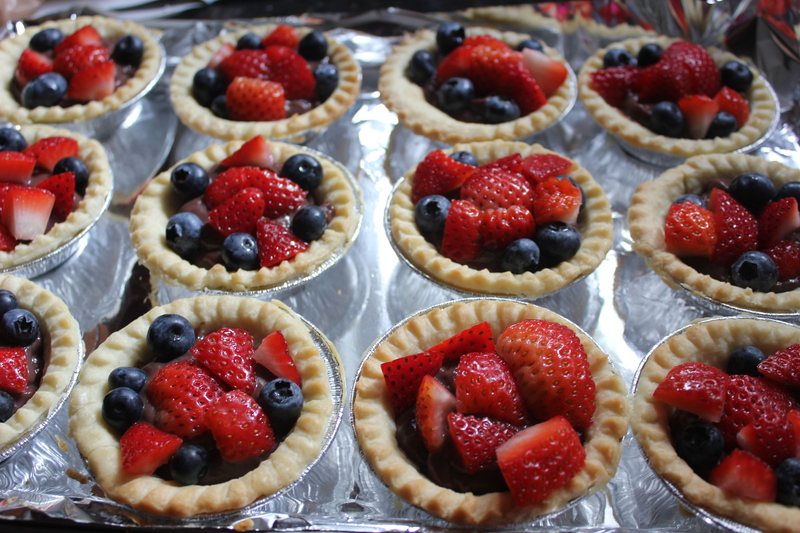 These mini tarts fit exactly what I needed : easy, tasty, and perfect for the warm weather! Make chocolate pudding as described on the box, I used low-fat milk. Apparently you cannot use soy or other substitute since the pudding will not form properly. I bought the frozen mini tarts (usually found with other frozen desserts at the store). Again, I needed something quick. You bake them from 10 minutes and they are all set for filling. 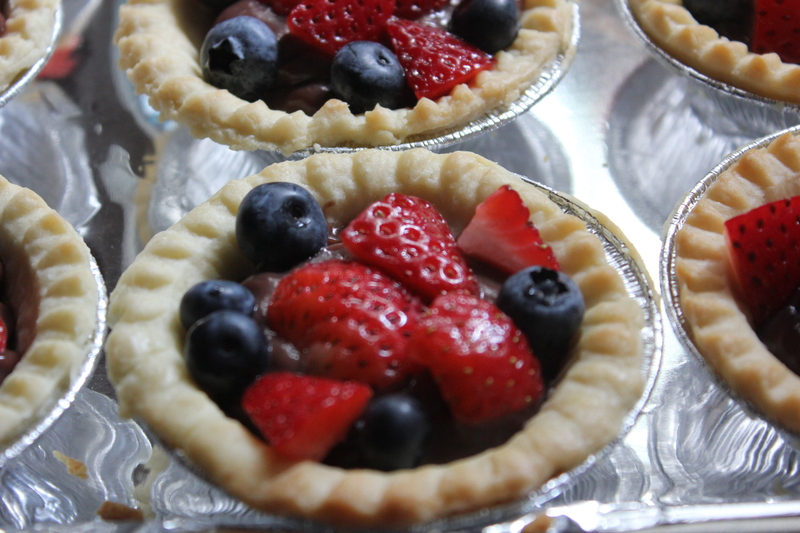 Fill with the chocolate pudding and top with fruit (I sliced the strawberries so they would fit). 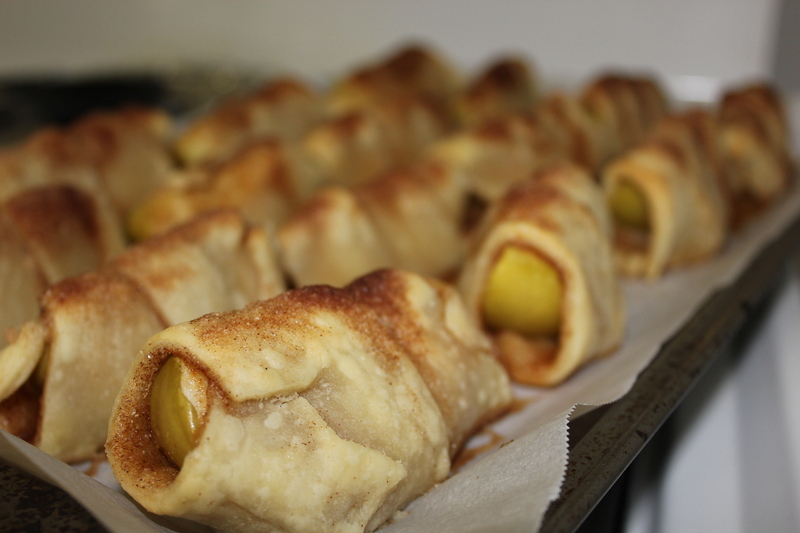 Put in the refrigerator for 3 hours (or more) and they are ready to go! Easy, I know! But also yummy! Eric topped his with a little powdered sugar. They are the perfect size for a few bites of dessert without overdoing it! I was craving a sweet treat but wanted it to be something small and not overly indulgent. After browsing a few blogs, I found the perfect solution on Cookin up north. Usually I am not a huge apple fan but these looked really tasty so I thought I would give it a try. In a small bowl, combine the sugar and cinnamon, set aside 1 Tbsp. On a lightly floured surface, unroll the pastry. Brush with 2 Tbsp. melted butter, sprinkle with remaining sugar mixture. Cut each sheet into 8 one inch strips, about 8 in. long. 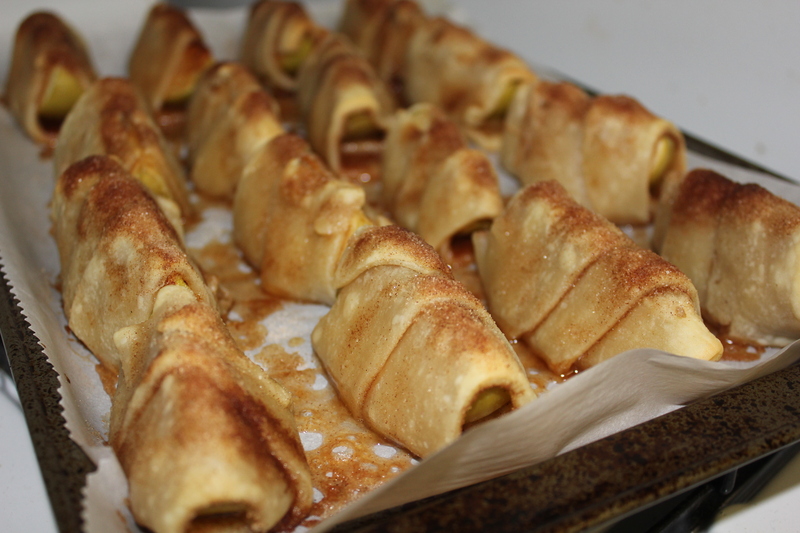 Wrap one strip around each apple wedge, placing sugared side of pastry against apple. Place on parchment paper lined baking sheet. Brush tops with melted butter and sprinkle with sugar mixture. Bake at 425 for 13-15 minutes or until pastry is golden brown. Serve warm. Makes 16. They smelled so good that I had to try one as soon as they were out of the oven. Delicious!!! Eric put it perfectly, it had just the right apple to dough ratio! Another football Saturday and the weather has been beautiful lately. This time last year, a group of us took a bus from Atlanta to Tuscaloosa, AL for the game. 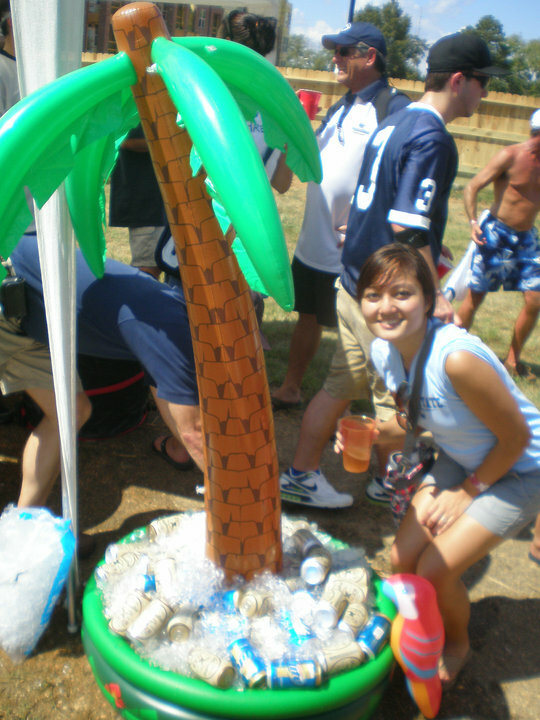 Even though we didn’t have tickets, we thought it would be fun to head out and tailgate. We arrived in AL bright and early and tailgated until the 8pm game. I just remember it being REALLY hot with no shade. Even though we ended up losing, it was still really fun out there. This time we had plans to get together with some friends and have a football afternoon. 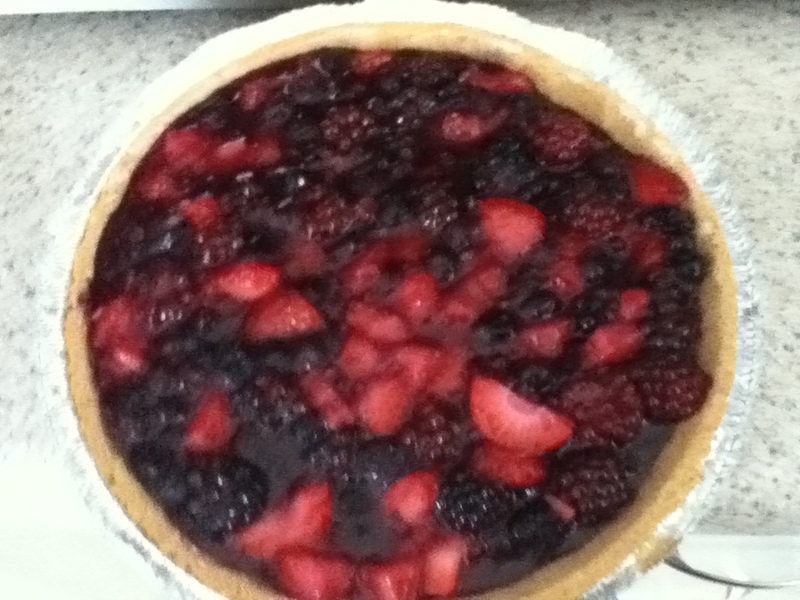 I decided that I would bring a mixed berry pie. 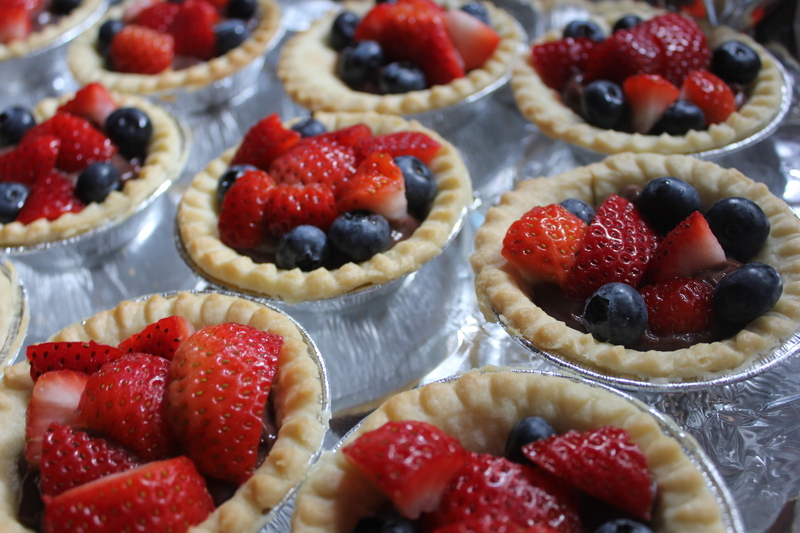 With the summer coming to an end, I thought this would be a great dessert to enjoy the summer berries. Last night, Eric and I went out to buy ingredients and found some great blackberries, strawberries, and blueberries. So this morning I woke up and prepared the pie, which is super easy! Thanks to my aunt for this simple recipe. I took the easy route and bought pre-made graham cracker pie crust. I have had this with just blueberries too. You just need 3 pints of fruit, sugar (I used 1/3cup), 2 tbsp of cornstarch, 2 tbsp of water, and a pinch of salt. Just heat half the fruit with the sugar, cornstarch, water, and salt. Bring it to a boil for 2 min then stir in the rest of the fruit. Pour into the pie crust. DONE! Chill for a few hours.